Garnish with avocado oil, chopped fresh cilantro and pumpkin seeds. You can reduce the amount of fresh ginger if you don’t like a strong ginger taste. Ginger is good for digestion and gives you an energy boost. Avocado helps your body absorb the beta carotene in the carrot juice. Beta carotene is an antioxidant. Several studies have shown antioxidants through diet help people’s immune systems, protect against free radicals, and lower the risk of developing cancer and heart disease. Avocado is also a healthy fat and gives the soup a creamy texture. Some high speed blenders will warm the soup a little after several minutes. You can also warm it over low heat or in the microwave. 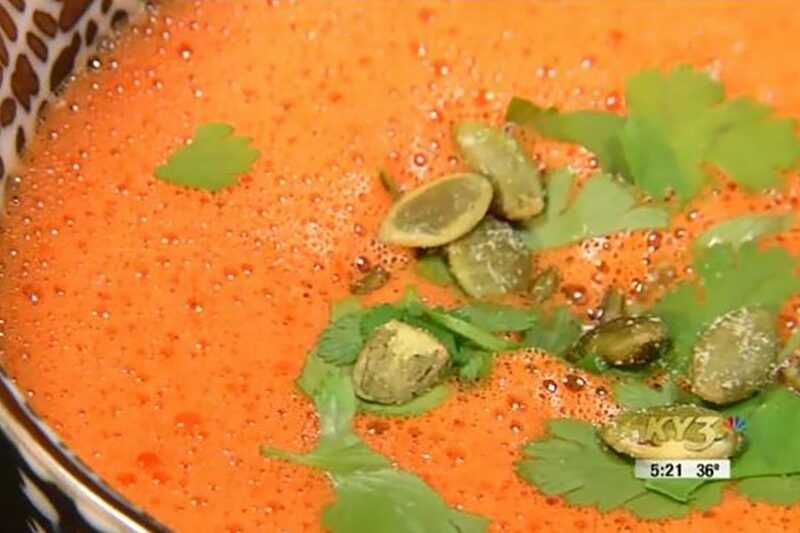 NOTE: Heating the soup to a hot temperature will kill nutrients.